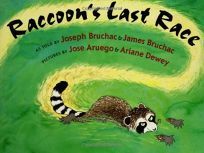 Father and son writing team Joseph and James Bruchac return with their third folktale, Raccoon's Last Race, illus. by Jose Aruego and Ariane Dewey. Here, long-limbed, speedy raccoon taunts his rivals as he easily outruns them. But when he has an accident, he gets his just deserts because of his ungracious nature. .